Would I knit it again? Yes! 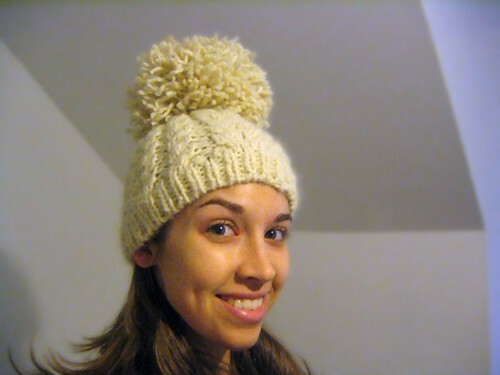 This was a quick hat with a very slow pompom. The yarn refused to be un-wiggly (one of the down sides of thrifting is the wigglyness), so I had to iron each and every strand I cut. Let me repeat: I had to iron every strand in that pompom. It was pretty brutal, but the end result is okay. 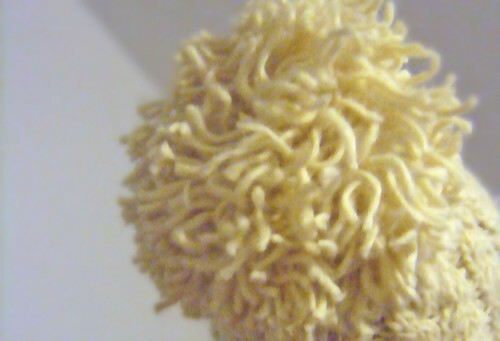 I love the pompom, but it still looks a little dishevelled. Being the good German that I am (by the way, that’s different from being a “Good German”), all my clothing must have clean lines and look shevelled. So we’ll have to see about the pompom. Plus, this thing is like an anchor! It’s constantly pulling the hat off my head. I think reducing the size of the pom is the only way to alleviate all these problems. 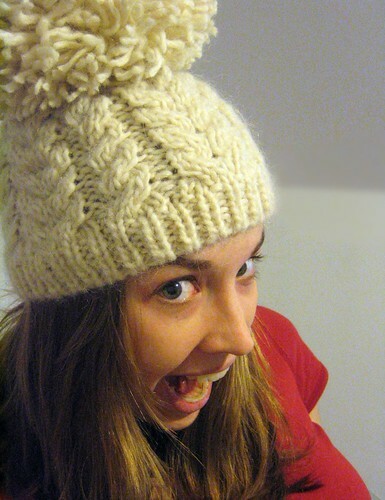 Quick note on how I knit this: I used a tubular cast-on with a needle two sizes bigger than the rest of the hat, and I think this is the solution to my tubular woes! The tubular cast-on is always really tight, but the edge of this hat is great. I’ll have to remember this next time! After the cast-on, I did about an inch of k1p1 ribbing, a pretty basic cable pattern and then some creative decreasing once it was tall enough. If anyone wants the pattern, I’d be happy to write it up! Here are a few more pictures. The pompom picture is a little blurry and crazy because there was such low light and I was getting lots of noise and ugliness so I had to do some photo wrangling in Photoshop. And the requisite wacky shot. Amelia Earhart Aviator Cap: Done! Again! Ooh, what a large pompom you have, grandma! Oh Eve…. that picture of you just made me laugh out loud and startle the cat. 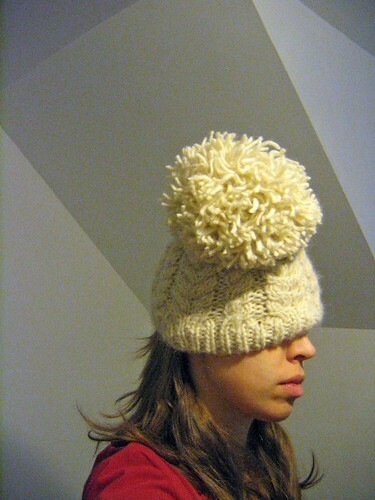 Alas, my knitting has fallen by the wayside but I soon hope to pick it up and I too want a hat with a giant pom pom. Liz I think comes back tomorrow, and I’m thinking that if she is tanned, I’m not letting her in. If it makes you feel any better, I was only moderately tanned when I got back from my cruise and I’d been there for three weeks AND tanned actively (with sunscreen of course, always apply sunscreen). Seeing as she is 97 times whiter than me, she will probably not be too tan. Eve, That is a super dope pom pom-squigglyness and all! Adorable! I would knit that in a heartbeat! Pom Pron! Whee! Gotta luvs it! Love the hat. *ducking as I say* Not a huge fan of the pom poms, but I never have been. 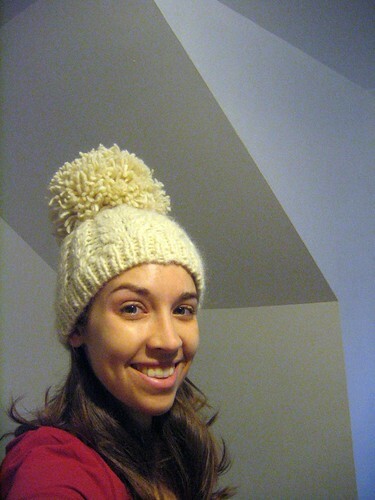 Just recently made my first ever cabled hat, but didn’t like the decreases, as they killed the cable pattern. If you were able to maintain pattern, I would love to see it written up! And as always, you’re just too cute and funny with your pics. This entry was posted on December 10th, 2007 at 7:45 am and is filed under Finished Projects, Hats. You can follow any responses to this entry through the RSS 2.0 feed. Both comments and pings are currently closed.